Meet Jenny-fur! She’s a pretty princess of a pup who likes to wear a pink sweater. The now 10-month-old pooch arrived at Bedford, Texas-based Homeward Bound Animal Rescue as a three-month-old puppy after she was surrendered to a local shelter shortly after being purchased at a pet store. The purebred Catahoula Leopard Dog is a medium-sized pup who is spayed and up-to-date on all shots. Jenny-fur has been a good girl while in foster care—she has befriended doggie playmates, loves the water, and has a ton of energy! 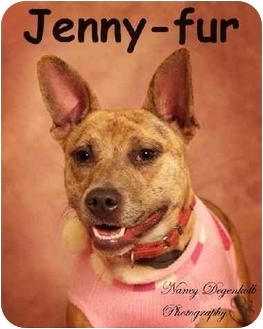 Thanks to our pet-loving friends at MyPetHealthGuide.com for featuring Jenny-fur and helping homeless pets!